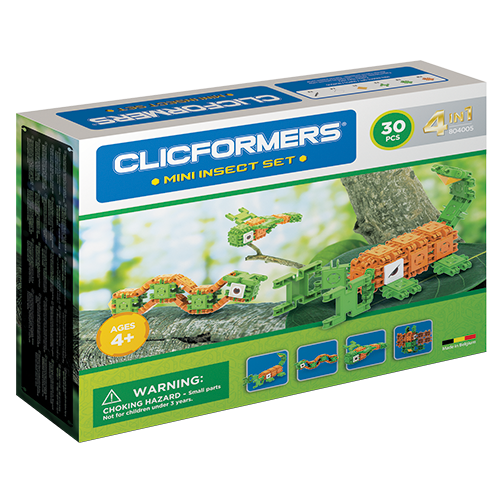 Discover the kingdom of the insects with this Clicformers Mini Insect Set. Follow the moth through the night, the dragonfly to stagnant water and the caterpillar through nature. Did you know that the scorpion is close family of the spiders and that there are about 1800 species? Fascinating! It is incredible that you can build 4 different constructions with only 25 Clicformers blocks and 5 accessories. Especially when you know that there are stickers inside the box to finish your creations! Do you have plenty of imagination? Well, get to work right away with this amazing construction toy. Moreover, Clicformers is an educational toy which stimulates the development of your child. Besides, all Clicformers are compatible with each other as well. Success and hours of fun guaranteed. At first sight, Clicformers look very similar to Clics. There are indeed a lot of similarities. What’s most important is that Clicformers is a fun, educational construction toy, like Clics. Yet, you can’t combine both building blocks, because Clicformers are not Clics. With Clicformers, you still build in the same way, namely by clicking the blocks, but Clicformers are capable of doing more, because of the new concept. – Clicformers are made of a different kind of plastic: high quality ABS. The building blocks can even be stacked on top of each other and they are more easy to be clicked. You only need half of the power compared with Clics. Clicformers are brighter and have an even more beautiful color. – Clicformers allow you to keep on building, even when you have made a little cube. Due to the hook-block, you can keep building on the outside of your construction. – Clicformers are bigger than Clics, so more and different geometric shapes can be added to the play sets in the future. Children will be able to build more creativity. The bigger building blocks of Clicformers also lie better in the hands of children. – Clicformers have holes in the flat part, which is smartly conceived to attach accessories, like deco plates, pyramids or domes. – Clicformers have little teeth on the connectors, whereby you can lock them in 11 different angular positions. In conclusion: with Clicformers you are able to build in 4 different ways: click, stack, fold and hook on,… in short even more building pleasure! WARNING: Choking Hazard – Toys not suitable for children under 3 years – the small parts could choke a child.